iZotope's Ozone 6 arrived with a slick new interface. 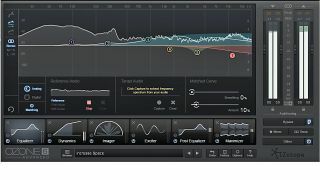 iZotope's superlative line of software mixing and mastering processing solutions have established themselves as industry standards, and with the recently released Iris 2, the company has upped its game in the synthesis arena, too. Ozone is now at version 6. How have people's perceptions of 'in-the-box mastering' changed over the years? Brett Bunting: "Over the last few years, I've noticed fewer engineers thinking in terms of mastering solely in or out of the box. There was an early landscape where seasoned professionals strictly worked with outboard gear, while up-and-coming engineers honed their skills in the box. Today, working in the box for some tasks has become ubiquitous for almost all mastering engineers, simply because there are things you're able to do in software that just aren't possible using hardware. "Ozone has changed the game by integrating all the necessary mastering tools in one solution that empowers all types of users. You can instantly spawn a complete mastering chain with its preset system, or meticulously create your own from scratch. What's given it staying power, though, has been the emphasis on forward-thinking algorithms and DSP." Could Iris' spectral editing approach work in other instruments? Jack Côté: "Iris can work with any audio you throw into it, so it doesn't matter if it's a drum sound, the pluck of a guitar string, or the sustain of a flute - you can grab it all, play it back, mix and merge it together with anything else you want! People are already using it to isolate the fundamentals of kick drums, snares, and hi-hats, then mapping those to keys to play back like a standard sampler drum machine." RX 4 has taken us one step closer to all-out witchcraft! Will we ever see a product for auto-deconstructing multi-source tracks? Aaron Wishnick: "Source separation is an active area of research throughout our industry. There are many approaches and plenty of challenges. First, it's hard for the computer to detect the different instruments and group them correctly. Once that's done, it's still difficult to isolate them. "As humans, we use a lot of top-down processing to do source separation in our heads. For example, if we hear a kick drum overlapping with a synth pad, we use our knowledge of what kick drums and synths sound like, as well as the repetitions due to the song's structure. State of the art research includes teaching the computer how to take advantage of this." You developed Stutter Edit and Break Tweaker with BT. What does this kind of collaboration bring to a finished product? Jack Côté: "The real benefit of working with any artist is the outside perspective they bring to the project. That greatly informs what we end up building. We always do our best to interview our customers as much as possible to make sure that what we're developing is as close to what they need as possible. Working with an artist like BT can take that process to another level, with deeper collaboration on feature sets, design, sound quality, everything. In the end, the hope is that you end up with a better product."